Is this the base for the obscure Disney movie? that has a pig that can predict the future? I don't think I would like to read the book either, though I liked the movie. Yes, the Disney movie is based on this book! Or the first book..erm, I'm not sure, but either way it's based on this series. 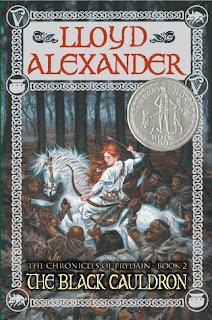 Try a different Lloyd Alexander book! Like the Gawgon and the Boy, or Gypsy Rizka, perhaps. I wasn't so into The Black Cauldron series either, though I'm a big fantasy lover and I loved most of his other books. That's right, hand in your fantasy-fan card at once! ;P Just kidding. I'm sorry to hear this one didn't work for you! I read these books first when I was much younger and I'm not sure how I would react reading them for the first time now. In any case, The Black Cauldron isn't my favourite of the bunch (that's reserved for the last in the series, The High King). Since this one was a disappointment, you probably aren't interested in continuing with the series, but if you do ever decide to pick another one up, I'd recommend trying The Book of Three. It might help you connect with the characters since it's the first book and introduces many of the characters that pop up in all the others. For unrelated-to-Prydain Lloyd Alexander, might I suggest The Arkadians? It's a stand-alone and has a stories-within-a-story kind of format. *hangs head and turns in card* :) I actually am interested in continuing on with the series. Partially out of a determination to see why it's so loved and if it gets better and partially because I own a few of the later books and I don't want to get rid of them until I've read them. I'll add the others to my list too :) Thank you! I love story within story formats. I remember finding Lloyd Alexander's books while I was abroad, and took a picture so I could remember to buy it when I can (which I didn't yet). Hmm, I don't think I would try this one, just based on the way I feel about the cover! LoL, I'm so shallow. I'm sorry you didn't like this one, I'm not going to attempt this one because if you are contemplating doing LAUNDRY while reading this, that can't be a good sign! haha I'm totally shallow like that too! I like this cover. It's a million times better than the cover of the version I read. Sorry it didn't work for you! This isn't my favorite of the series--for me, it's Taran Wanderer, although it's more an intropesctive hero's journey, with the action being more small and personal, and less epic (even though there are some Exciting Adventure bits). I find that sort of journey more interesting, even though less is "happening." 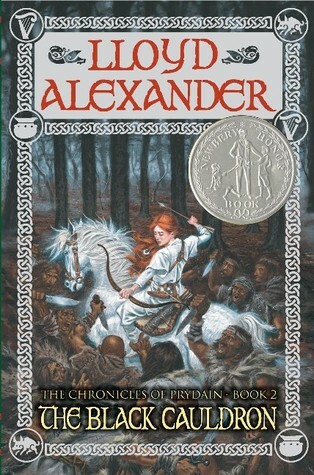 I think Taran Wanderer might be one of the ones I own, so I'll be reading it at some point! I do like that type of journey, but I also like the high action kind. I almost choked when I saw that you had given this one 2 stars. Not because I loved it--I haven't read it--but you nailed it. This is a fantasy classic. But characters that were like trying to hug damp cardboard? Oof. No wonder you were fantasizing about doing laundry. I can't wait to see that card! Will it be sparkly? I was in the baking aisle today and saw edible sparkle sprinkles and I almost bought them for you but they weren't nearly sparkly enough. My search continues. I went to try to find the sparkly coins for you again this year...but I CAN'T FIND THEM. I'm having a mini-panic attack about it, but I will prevail. More importantly...sparkliness will prevail. Recently I read about the first chapter of The Book of Three by Lloyd Alexander and then stopped. I also felt like some sort of failed fantasy fan, but at least I know now that I am not alone! Whew, it's good to have company in this lonely little bad fantasy fan corner :) I skipped The Book of Three because I heard it was a little boring. I don't know if that was a good move on my part or a bad move.